The purpose of this standard is to provide wireless connectivity for fixed, portable, and moving stations within a local area. This standard also offers regulatory bodies a means of standardizing access to one or more frequency bands for the purpose of local area communication. Amendment Standard - Active - Draft. 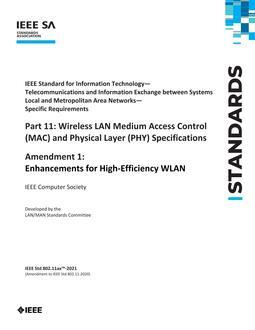 This amendment defines modifications to both the IEEE 802.11 physical layer (PHY) and the medium access control (MAC) sublayer for high efficiency operation in frequency bands between 1 GHz and 7.125 GHz.